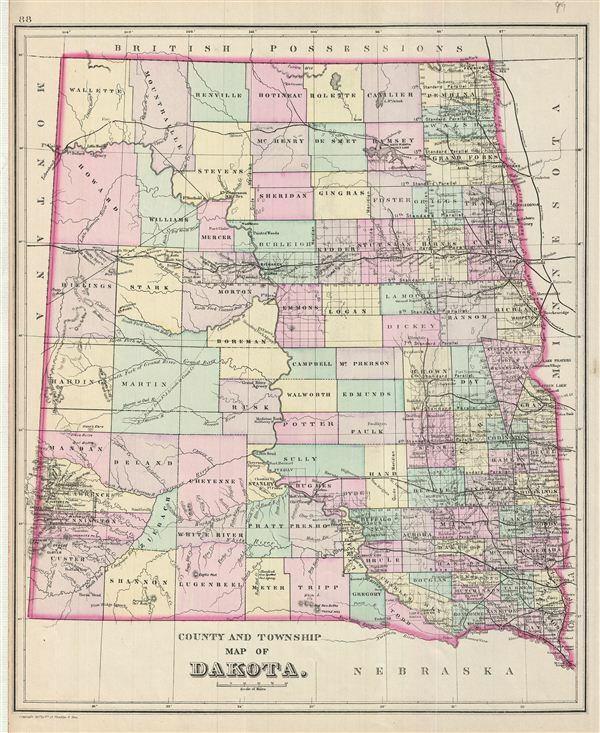 A fine example of William M. Bradley's 1887 map of Dakota. It covers modern day North and South Dakota in before they were separated. The map also delineates survey grids referencing the work of the U.S. Land Survey. Various towns, cities, forts, rivers, railroads, roads, American Indian reservations, settlements and an assortment of additional topographical details are noted. Map is color coded according to regional and political boundaries with elevation rendered by hachure. Copyrighted 1887 by Wm. M. Bradley & Bro., for issue as plate no. 88 in the 1887 edition of Mitchell's New General Atlas.